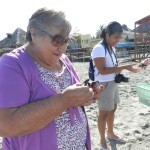 Manica gave us each a sea turtle to name and release into the ocean. 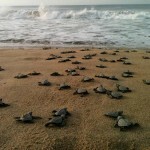 Turtles instinctively migrate towards the sounds of the ocean. However, only one out of a thousand survive! Humans are their deadliest predator. 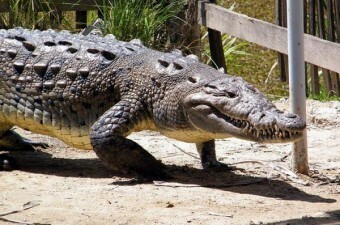 Also, while in the ocean, they are typically eaten but other fish or birds. 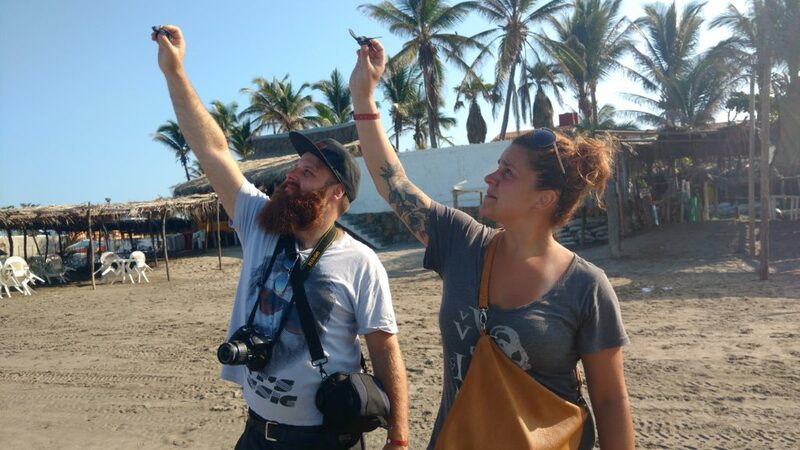 The Sea Turtle is making a comeback in the waters of Acapulco and you have the opportunity to help. 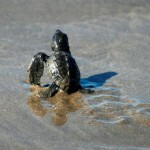 You will choose a baby sea turtle that has been raised by the Turtle Conservation Program. 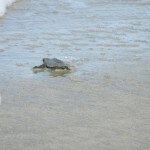 You can adopt the turtle and then, through your efforts, release the baby into its natural habitat in the sea. 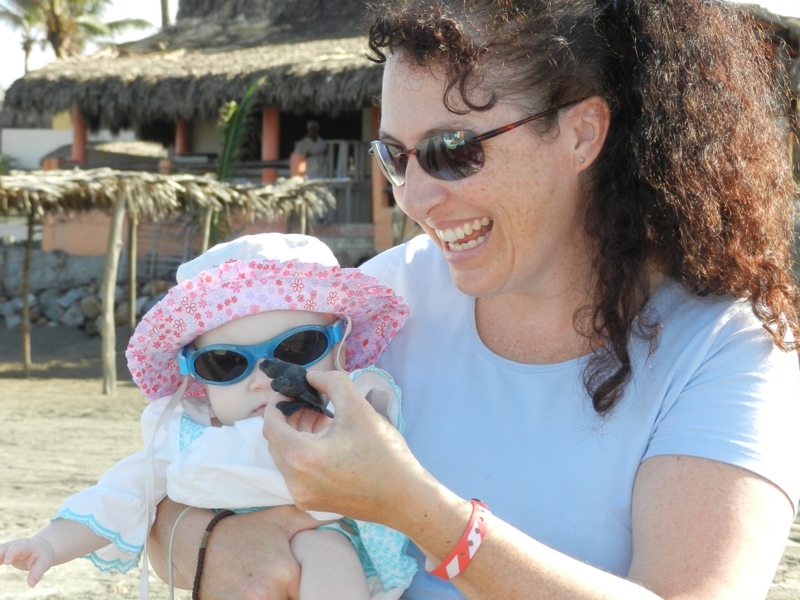 As the baby takes its first swim in the natural waters of the Pacific, you will be there to witness this momentous occasion. 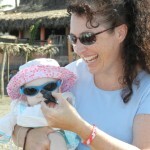 We will take a scenic ride through downtown Acapulco and down the coast, heading southeast. 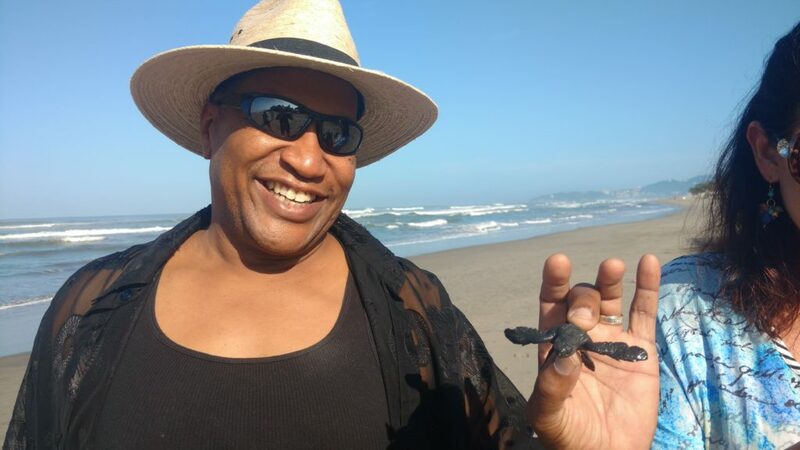 About 25 miles away, on a tranquil beach, is the Sea Turtle Rescue Center. 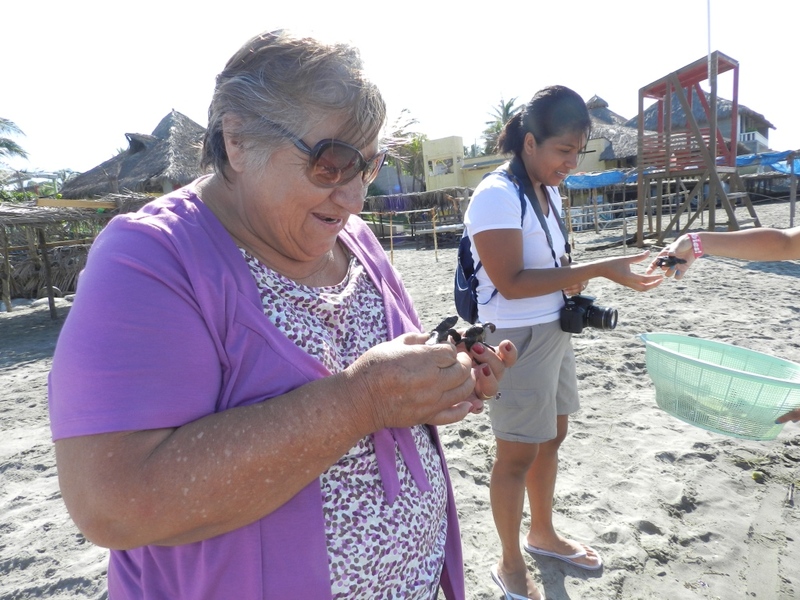 Operated by a local environmentalist, the center works to improve the chances of survival for the endangered species of Golfina sea turtles. This is truly a tour you can feel good about taking! 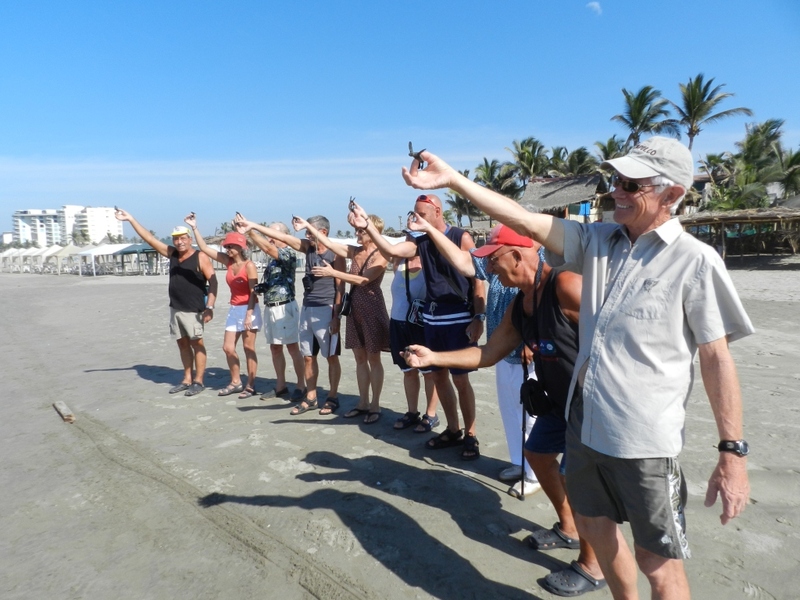 The Turtle releasing Camp is located in Barra Vieja, along the main coastal highway, Carretera Acapulco Pinotepa, kilometer 32. 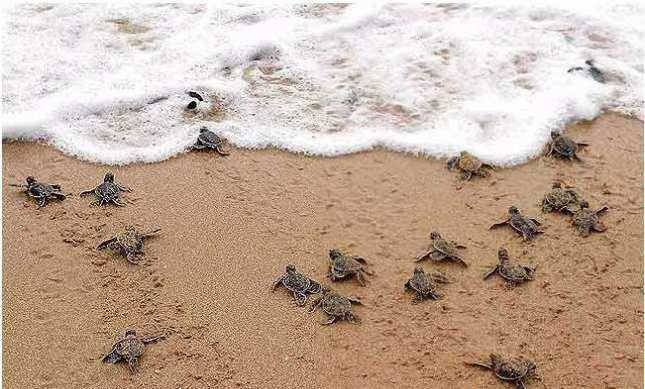 When the baby turtles hatch, they make sure the hatchlings at least make it into the water, by taking them down to the ocean and releasing them in large groups so some have a chance of survival. This is a lifetime experience. Your participation in this program will go a long way towards protecting the turtles now aExperience, enjoy and discover the baby turtle release ceremonynd for future generations as a portion of the revenues from your visit will go to maintaining this very worthwhile program. 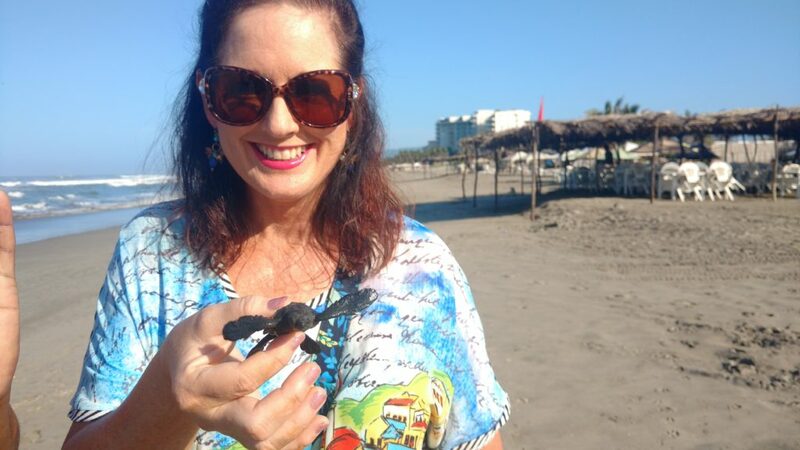 Your family may participate in releasing the cute baby turtles. 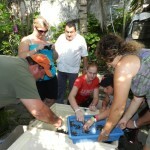 Each of our kids held a turtle briefly while waiting for the staff in preparation for release. 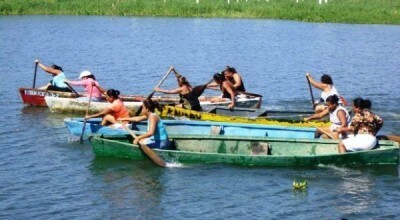 This is a unique opportunity for a select group of travelers to participate in a very worthwhile cause. 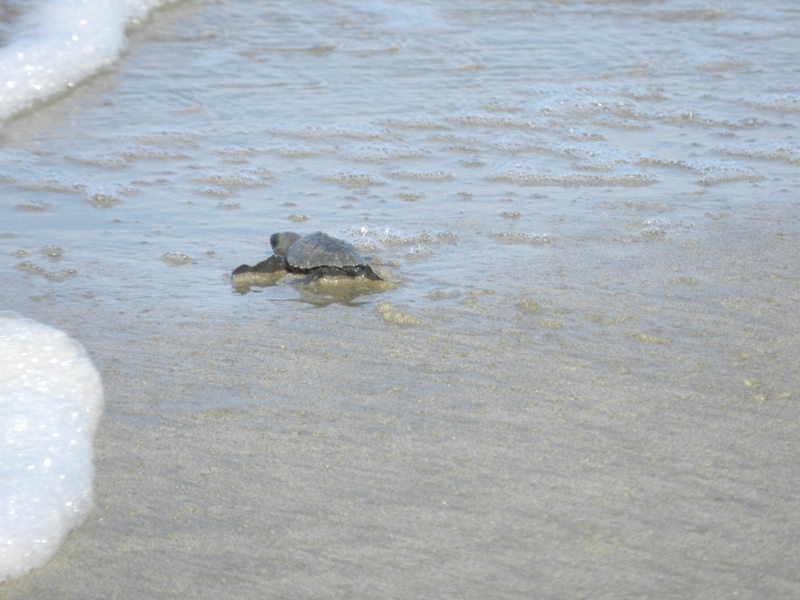 Participants will have the chance to free just born sea turtles back to the sea. On arrival, you will be briefed on how the program works and how it is helping the environment. 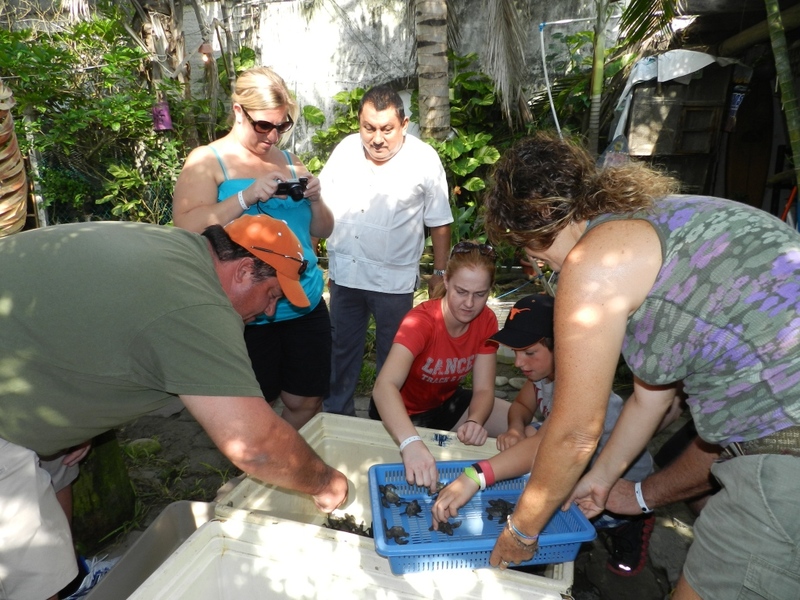 View baby turtles in various stages of development, from the eggs that have been rescued, to the tanks holding the hatchlings that are ready to be returned to the sea. 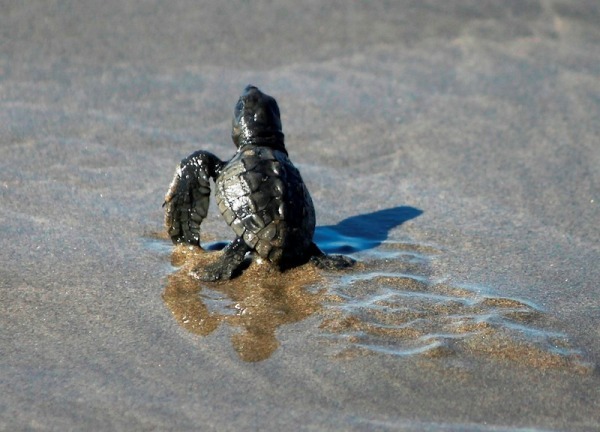 Walk with your baby turtle down to the shoreline where the turtles will be named before they are released to the wild. To the count of 3, ready to set them free. 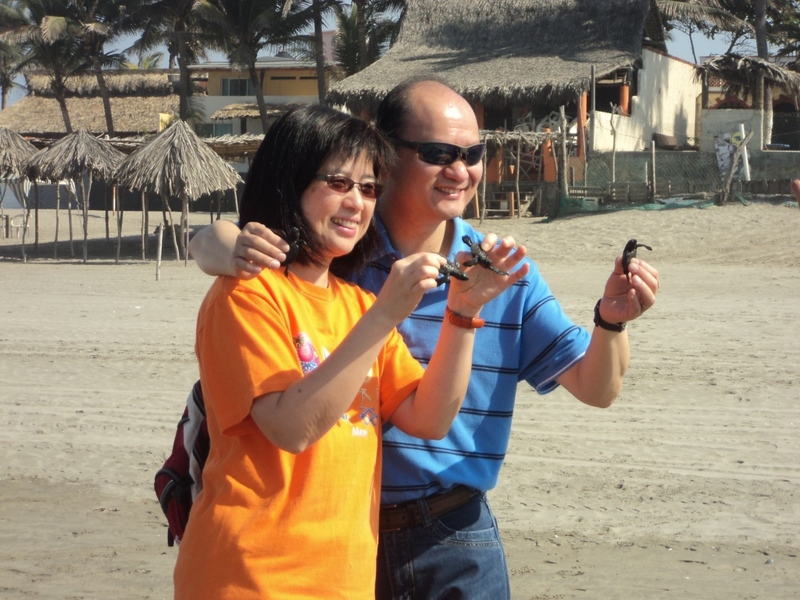 TRIP ADVISOR REVIEW In Jan. 2007, we visited the turtle camp at Barra Vieja, on our way back from a boat tour of the nearby Laguna de Tres Palos. The beach is simply gorgeous! 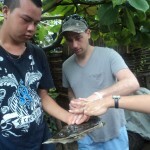 And the turtle camp is very interesting. 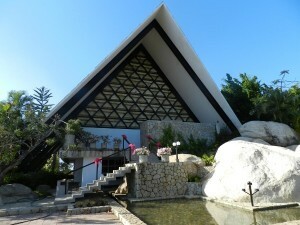 It is located along the main coastal highway, Carretera Acapulco Pinotera, kilometer 32. The turnoff/sign is shown in the first picture. 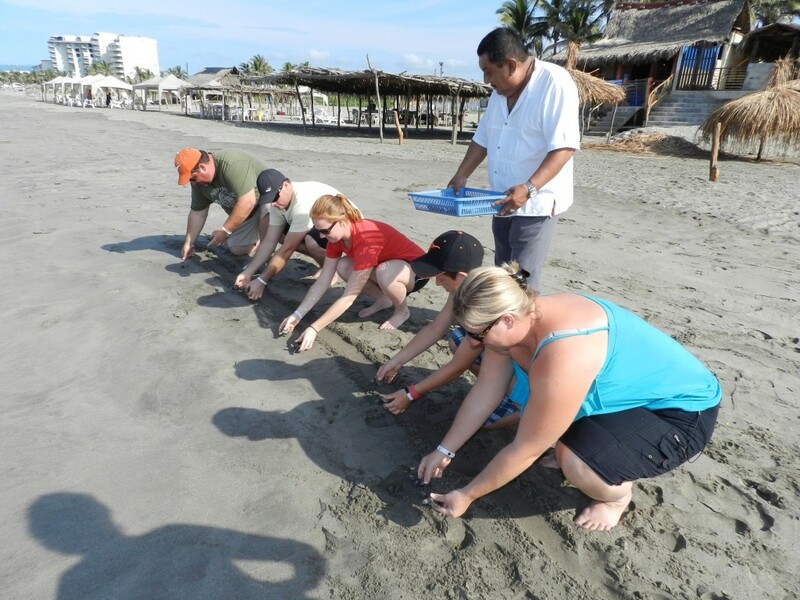 They find endangered sea turtle nests and bring the eggs to the camp, to incubate in a protected area safe from poachers and predators. 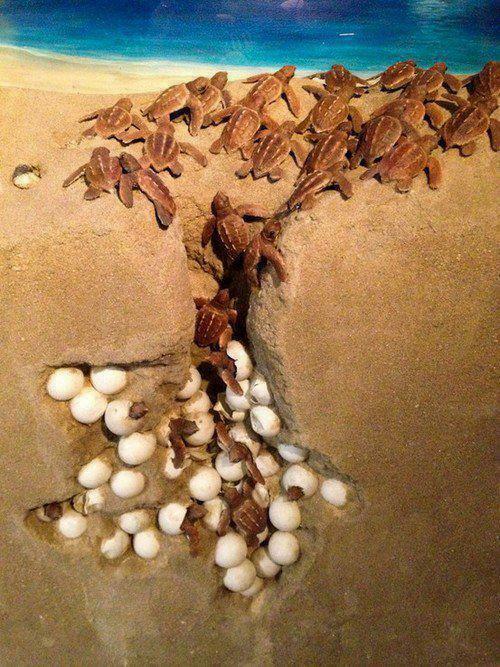 When the baby turtles hatch, they make sure the hatchlings at least make it into the water, by taking them down to the ocean and releasing them in large groups so some have a chance of survival. 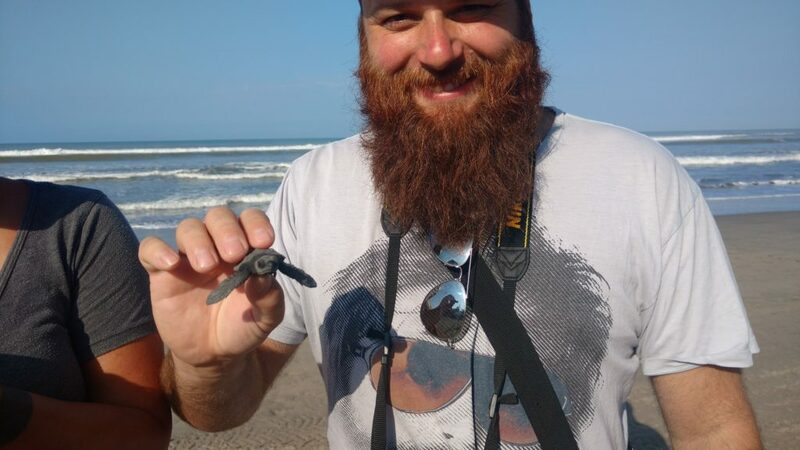 The baby turtles were adorable! We were happy to support such a good cause. Then we stood silently watching the baby turtles make their way to the ocean and eventually carried away by the tide (no flash photography allowed). 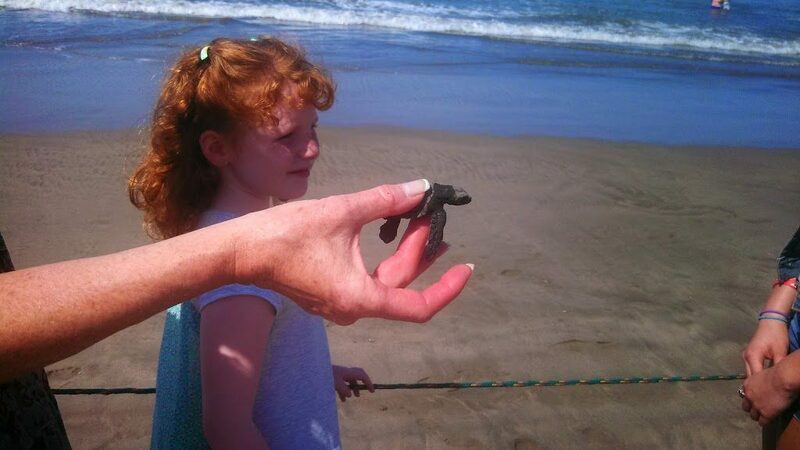 The children are told that the sea turtles were a protected species and only very few released would survive. The turtle camp staff finds endangered sea turtle nests and bring the eggs to the camp, to incubate in a protected area safe from poachers and predators.